VSR3, Reverb from Music And More. _ Reverb vintage triple spring reverb, with springs Acutronic used on prestigious vintage models (Hammond, etc.). _ Wahouuuuuuh, the sound is terrible! it was really the sound of springs, a super nice reverb typical 60's, which will remind guitarists the heyday of surf fans to b-movies and horror-organ films Z, dubbeurs some major hours of Studio One, etc.. and fans of the electronica echoes the snares of Squarepusher! ! _ Triple springs, good size of them (the width of the rack, I think) = the sound! Modulation warm, resonant, cheap and super nice: short: deadly! no, the spring test are rare, but compared to software emulation, ç an'a nothing to do. I found it used, so the report is good, not knowing that eje could never see in France, and that I Sembel rare. Sinkmusic has the résumé of VSR3 CHARACTERISTICS. She does not know what to vibrate its springs, but what it does it well! You have to imagine that each new addition the dj vibration produced by the springs. I think it ct polyphonic rverbe, no formulation can reproduce it. I use it for a few months when I rcoute the mix where I used what it adds characters! Again, it's a rare terrible mconnue yet what it does. I think that was one of the must-have effects in the context of a studio numrique. This is the silver bullet for the Dub. 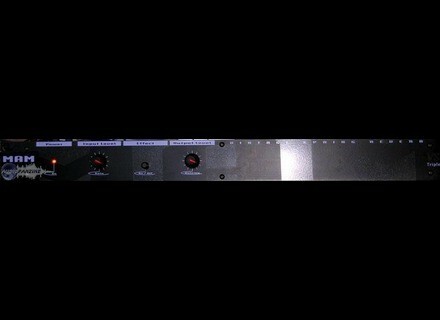 3-spring reverb rackable.entrée mono output stereo.Aspect not terrible. Reverb long enough kind 4s ALMOST sounding spring reverb of course, but clean enough to say that c is little noise to them hereunder Spring has acute in comparison to other models that will be more used in special effects, so it just be used in any other style that reagge dub. I is not 10/10 because the sound emitted is slightly too dark but good, a eq or filter output or between, and it s apercoi very quickly that the sound comes out is really good: very broad in frequency and " false "stereo output gives a boost to the spatialization of. the output level is slightly too low but the ratio S / b is sufficient as bad as on vintage models not pro. Very nice saturation when you put serious dedant (like a bass, and yes ^ ^) n which is the case only on very rare models of this kind (Furman; space eko; dinacord support very badly by the severe ex) . For the only info that I saw is best for the moment c is the SCV rbs rare but more cumbersome. Works on all intruments has provided if necessary to filter or eq front (the best in my opinion) or after in order to obtain a equibre matches. The recent best spring reverb I think, to my knowledge anyway, has a reasonable price. The weapon Fatal Dubber fan of dub music 60s or 70s darken.